Market variables weren’t much of a concern for the late Guy Ray Rutland of Independence, Kansas. “I’d rather invest in horses than anything else I know,” Rutland told me in 1984, shortly after the failure of Oklahoma-based Penn Square bank and the beginnings of a far-reaching savings and loan scandal. Rutland, who was born in 1917 and died in 1988, was the leading breeder of racing Quarter Horse register of merit qualifiers for nearly 40 years. His influence went far beyond racing, however. 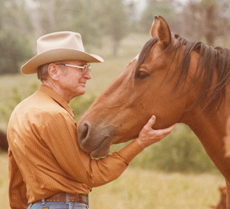 During his lifetime he was also recognized as a leading breeder of AQHA performance point earners, halter class winners, show ROM, and champions. Cutting horse breeders are indebted to Rutland, as well, as the breeder of Dusty Socks, who can be traced back through her daughter, Bar Socks Babe, to the pedigrees of many contemporary champions, including 2008 NCHA Futurity champion Metallic Cat. As we neared the herd, here and there a mare sauntered away from the group to greet Rutland, who offered her an affectionate pat and related her pedigree to me. It was in 1946, while scouting out a palomino stallion for a friend, that Rutland found the yearling Little Yellow Fox at a horse show in Ada, Oklahoma. “He was the color of a gold coin,” said Rutland, who bought the colt for $1,250 and renamed him Gold King Bailey. Gold King Bailey won grand championships at the Denver and Fort Worth Stock shows and beat all comers on the racetrack, even as he began to produce future race, halter and performance winners. The first was Star Of Texas, who Rutland rode in a pasture on the first saddle and drove a cow and her calf out of a herd. “The calf was following (his mother) so good that I cut the cow away from her calf and drove her to the house,” Rutland remembered. “That was the very first day in his life that he ever had a saddle on his back. Gold King Bailey was the foundation of Rutland’s breeding program. The palomino stallion was sired by Hank H, by King, and out of Beauty Bailey, by Old Joe Bailey, out of an unnamed Yellow Wolf daughter. Rutland purchased mares for Gold King Bailey based on the era’s predominant bloodlines – King, Leo, Vandy and Three Bars, but also with a critical eye towards conformation. Pacific Bailey, out of the Leo daughter Nell Bert McCue, succeeded Gold King Bailey as Rutland’s head sire in the late 1960s, and was joined by Bar Money, by Three Bars; Star Bright Moore, by Star Deck; and the Thoroughbred Carrara Marble, by Coldstream, among others. Rutland built a 252-foot by 320-foot barn in 1973 to accommodate his sales. It contained 148 concrete stalls each measuring 16′ x 16′ and had an arena in the middle that could hold 30 portable stalls. Few who attended Rutland’s sales went home with an empty trailer, and they came back year after year. “Make new friends, keep the old, the one is silver, the other gold,” was an adage Rutland printed across the botttom of his sale ads and in his catalogs. It was a standard for his personal and professional life. In spite of the depressed economy at the time I visited Rutland, he was still optimistic about the horse industry.